Their topics range from robotics to speech recognition and virtual reality: this weekend, 26–28 October, some 60 prospective start-up founders will meet at the CITEC Building on Bielefeld University’s North Campus, where they will develop concepts for tech-start-ups over 48 hours, drawing upon new insights from research. 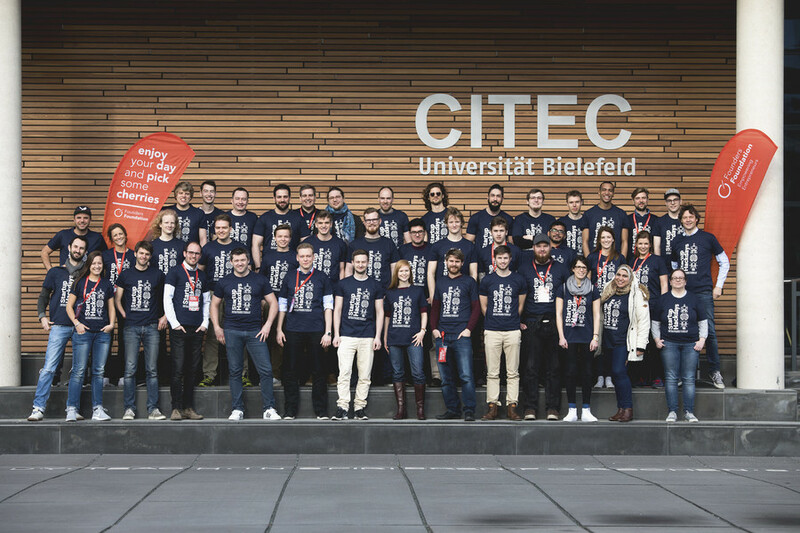 Bielefeld University’s Cluster of Excellence CITEC and the Founders Foundation are working together to host “Hackdays,” a funding initiative for start-up founders. In a public presentation on Sunday, a jury will assess what the teams came up with, and the winning team will be given access to a start-up grants of up to 40.000 Euro. Hackdays participants come from Cluster of Excellence CITEC and other institutions and departments at Bielefeld University, as well as from industry. Among the participants are researchers from computer science, psychology, and mathematics, as well as professionals in software and hardware development, graphic design, and business administration. On Friday, they will come together in teams to conceptualize a start-up idea, or work on existing startup ideas. The teams will then develop prototypes or demonstrations that they can use to pitch their business ideas. The terms “Hackdays” or “Hackathon” originally referred to events in which the participants developed new software and hardware together in a kind of “marathon.” “Hackers” are in a sense innovative “tinkerers” who modify and reprogram existing technology in order to have it serve a new purpose. The Founder’s Foundation, which was established in 2016, is an initiative to provide training, advice, and networking opportunities to start-up founders in the business hub of Ostwestfalen-Lippe. Financed by the Bertesmann Foundation, the platform is meant to attract talented individuals and connect them to companies and research institutes as well as with Internet-of-Things initiatives. Beginning on Sunday at 3:30pm, groups will present their start-up concepts – their “pitches” – in the foyer of the CITEC Building (Inspiration 1, Bielefeld). The awards ceremony will be held afterwards, at 5pm.